As Pocket Monsters fans, the idea of being able to see every piece of animation just seems to be something that anyone can do. If it's on TV or in theaters, it'll eventually get a dub. Even those stray episodes here and there that don't make it over find their way onto P2P websites one way or another. However, there's something that you probably won't see released officially on any home format or bootlegged. 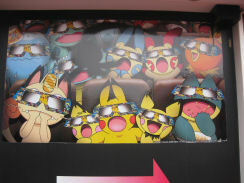 And that something is the Pokemon 3D shorts. 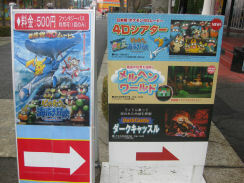 Between 2005 and 2006, two 14-minute 3D shorts were released in Japan. 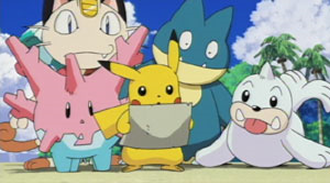 The first short, “Search for Myuu!”, was released in 2005 and featured the pokemon from Myuu and the Wave-Guiding Hero, Lucario. 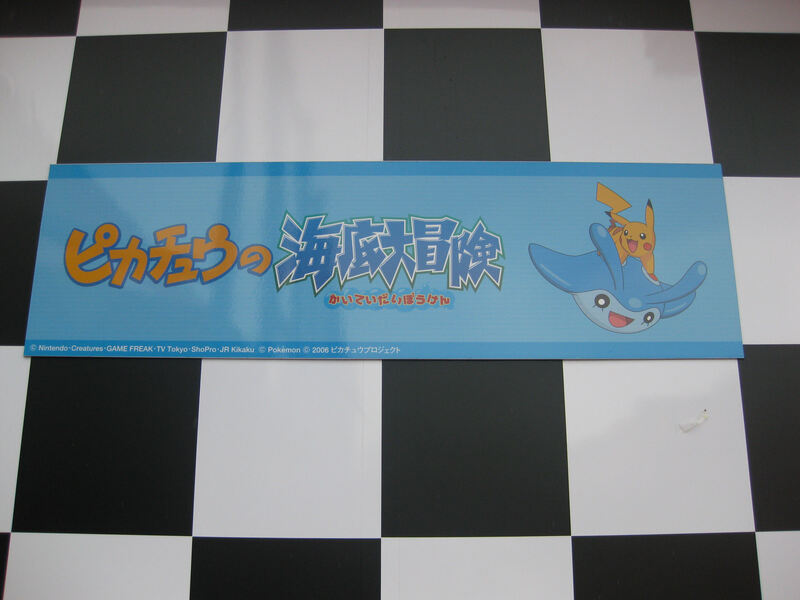 The second short, and the one that'll be discussed in this feature, is “Pikachu's Big Seabed Adventure.” It features pokemon from Pokemon Ranger and the Prince of the Sea, Manaphy. I recently had the chance to see the second of these 3D shorts. I would like to share my experience. On a cold and rainy November day, a friend and I went to Nasu Highland Park. The theme park, located about two hours’ north of Tokyo, opened in 1979 and is one of the few theme parks in the world to have its roller coasters intertwined with each other. The park hosts a number of other attractions, such as Lego Stadium and an area decorated in 1950s Americana. At the time, there was also a Mobile Suit Gundam 30th anniversary exhibit. 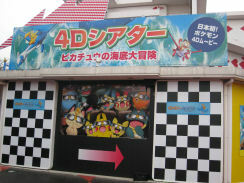 The main attraction, for the purposes of this feature, however, was the 4D theater. We started by going into the theater and waiting in the lobby. They had everyone wait in four or five rows, one for each row in theater. 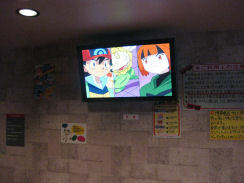 As we waited, an episode of the TV series, “The Shin’ou Space-Time Legend," was being played on an HDTV in the lobby. The room had various posters and images of pokemon on the wall, but the decorations looked like they were put up in a hurry; it was pretty obvious that this set-up wasn't meant to be permanent. Eventually, we were allowed to go into the theater. 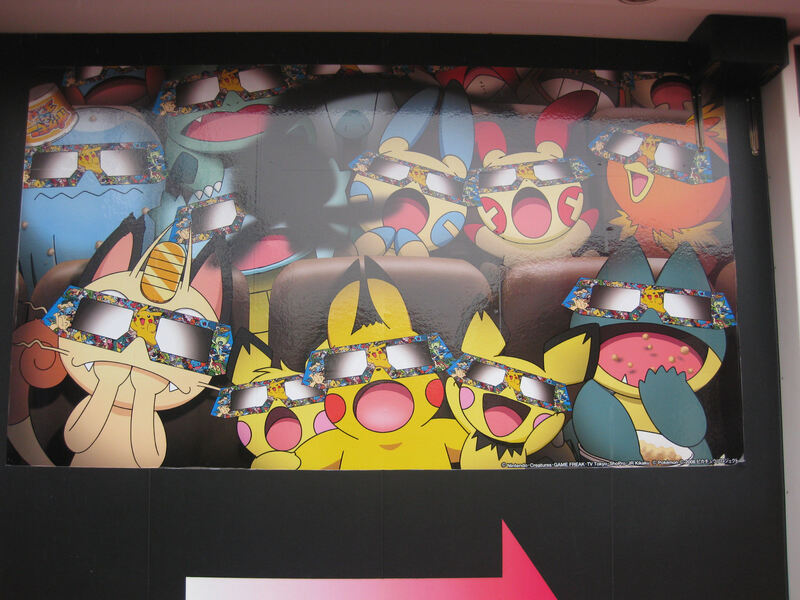 As we walked inside, we were given a pair of 3D glasses and found our seats. As everyone took their seats, the short’s ending theme, “Big Nyasu Day,” played over the speakers. Before long, the movie started. After a screen popped up warning us not to use the glasses for anything other than watching this particular movie because it could hurt our eyes. Here's my summary of the short; it is, unfortunately, taken from memory and may contain a few omissions / errors. One day, Pikachu's, Nyasu, and a bunch of other pokemon are relaxing on a beach on an island somewhere in the south. The pokemon play with a beach ball, but their game comes to an end when they knock over Nyasu's juice. Once it's cleaned up, a Perrap flies overheard. The music note pokemon releases a treasure map that it had been carrying into Nyasu's lap. 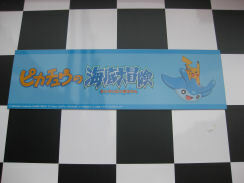 The pokemon then tells him, in a parrot-y way, that the map shows the way to a jewel known as “Whale'oh's Tear” (ホエルオーの涙). 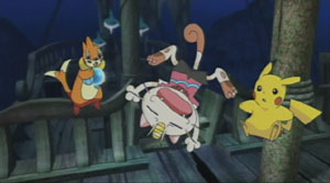 Nyasu notices that the treasure appears to be near a rock shaped like the pokemon Lunatone. Just then, a mirage dashes across the screen. Much to Nyasu's and Pikachu's surprise, Latios and Latias appear! Using their psychic abilities, they make it so Pikachu's and Nyasu are able to breathe underwater! Now that the preparations are complete, the pokemon can begin their big seabed adventure! The pokemon look around for a while, but they can't find the Lunatone rock. They spot a Solrock-shaped rock, but no Lunatone. The search continues, and Pikachu's and Nyasu eventually come across Lugia and Manaphy. 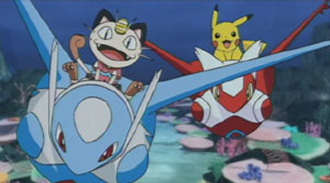 The two legendary pokemon point our heroes to the location where the Lunatone rock is. After searching around for a while, Nyasu and Pikachu's realize that they had been staring at the rock the whole time; the problem was that they were looking at it from a weird angle. Once they correct that, however, the Lunatone rock is easily spotted. Below it is a sunken pirate's ship. 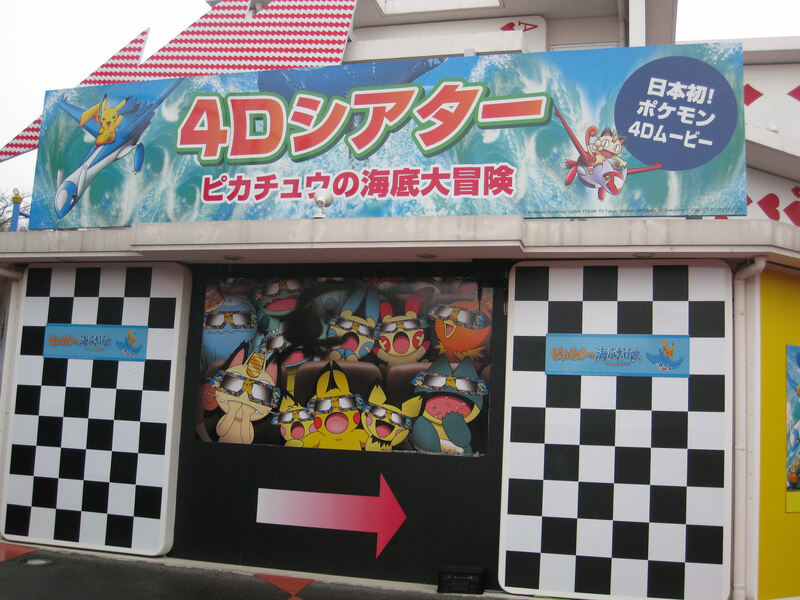 Once they've arrived, Pikachu's and Nyasu are greeted by a Buoysel. The playful pokemon swims around harmlessly as our heroes dive deeper into the ship. After encountering a scary Huntail, the duo finally arrives at the room where the Whale'oh's Tear is held. The jewel, as it turns out, is a blue orb roughly the size of a soccer ball. As Pikachu's and Nyasu play with it, they notice that Buoysel looks upset. Nyasu figures that the treasure must be the pokemon’s favorite object, so he decides, after some internal arguing, to return it. However, the orb is suddenly lost! The orb ends up in a number of places, such as the inside of a Pearlulu's mouth and the water spout of the pokemon the treasure is named after. Eventually, the orb is returned to Pikachu's and Nyasu. After thinking about it for a few moments, they hand it back to Buoysel. 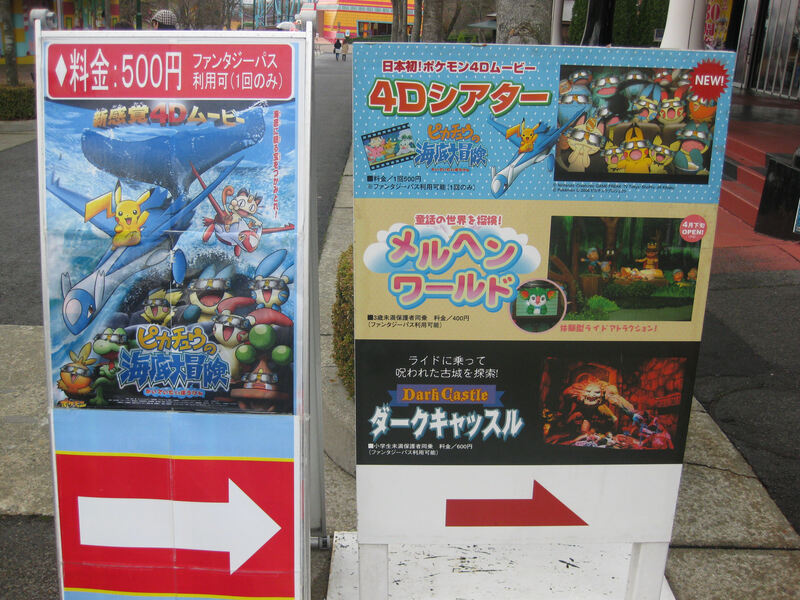 The pokemon cheers up, and Pikachu's, Nyasu, and Buoysel head to the surface. As the short ends, the pokemon all play together happily. As you can see, the plot for this short is very simplistic. But for a 3D movie like this, the plot isn't anywhere near as important as the presentation. Of course, with this being a 3D movie, it did pretty much all the things 3D movies do. Characters would lean forward and poke their heads out into the audience. Objects would appear to go flying forward. Foreground objects would pop out. Y'know...the usual. But you may have noticed that the poster I have on this short's main page touts it as being a "4D Movie." That's because, at Nasu Highland Park, the film is shown with a few extras touches to make the experience that much more unique. 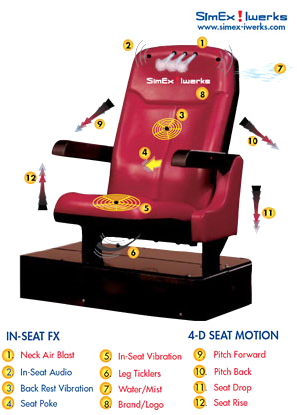 The theater we were in had seats that would jerk back and forth and / or vibrate to accompany the onscreen action. So when the pokemon are throwing a beach ball to one another in the beginning, the seats would jerk whenever the ball would get hit. Sprays of water spritzed our faces whenever the pokemon jumped into the water. Dry ice filled the room when Latios and Latias used their psychic powers. Bubbles rained down from the ceiling during the segments underwater (causing some of the kids in the audience to reach out and try to grab them). Small bursts of air attacked our faces when Nyasu and Pikachu were shot up from the Whale’oh. When the movie was over, you could hear the kids excited about the adventure they just took a part in. The sounds of laughter and happiness could be heard as we exited the theater, and it really seemed like the kids had a good time. Now what about a Western release? Apparently, an English dub of this short was actually released in the U.S. in July 2008. It appears to have been distributed by SimEx! Iwerks, who's posted a trailer for the short on their official YouTube page. The information on the trailer says it was played at a Jordan's furniture store in Avon, Massachusetts. The blog they link to, www.pokemon4d.blogspot.com, appears to have been shut down as well. The short doesn't seem to be playing anywhere at the moment, but if it does, I'll be sure to let you guys know.